Volcan Masaya National Park is part of the Tentative list of Nicaragua in order to qualify for inclusion in the World Heritage List. Nicaragua is a land of volcanoes, and the Volcan Masaya is the most spectacular of them all. It's an active complex volcano with a total of five craters and numerous other volcanic features. Masaya continually emits large amounts of sulfur dioxide gas. The site has been on the Tentative List since 1995, but seems to have never been seriously considered. 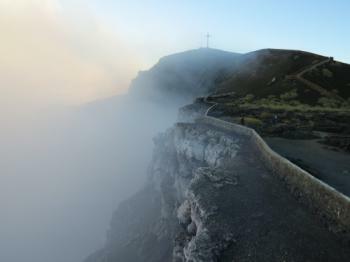 Volcan Masaya lies within easy reach of a half-day trip from Managua or Granada. It's a very accessible site with a car/taxi or an organized tour. I visited it on a 'Night Tour' from Granada - we were 17 tourists divided over 2 minibuses. After a short visit to the historic market in Masaya City, we arrived in this National Park at about 4.30 p.m. Apparently this is the only volcano in the western hemisphere where you are able to drive to the rim. And that's what we did first: stand next to a steaming crater. There was so much smoke that it was not possible to look down to see what's boiling inside. Because of the gases, you're only allowed to stay in this area for 5 minutes. I found it remarkable that you're allowed so close, the only risk mitigation measures are signs with texts like: "In case of expulsions of rocks, protect yourself inside your car". With dawn approaching, we started the second part of the tour in a different area of the park. This is the part where we had to put on a helmet, fit a gas mask and carry a torch. Trying out the gas mask provided some nervous giggles in the minibus - you look ridiculous, but you want to do it absolutely right for your own safety. We were to visit an underground tunnel which was formed by lava streams and observe (mildly) interesting rock formations. We never got that deep inside that we actually had to use the gas masks, so it was a bit of a hype. Afterwards we walked in a row (donning our gas masks this time!) to a spot nearby to watch bats depart from their caves. Darkness had fallen in the mean time, so the creatures weren't easy to see. We weren't allowed to use the torchlights as those would scare away the bats. I just took some photos with flash, and hoped there was someting visible. And indeed - a few shots included a single bat venturing outside. Though this is the closest I have ever been to the crater of an active volcano, I wasn't "blown away" by the experience. Unfortunately we did not see the glowing lava streams that are often visible here at night. I also doubt I will ever be rewarded with a WHS "tick" for Masaya. The number of volcanic sites on the WH List is already long, and according to a Thematic Study by IUCN has reached its limits. A few obscure gaps are still there, but Masaya doesn't fill any of them. Still it's a popular outing from Granada and a nice asset for the up-and-coming Nicaraguan tourist trade.